CHICAGO (April 5, 2011) - In These Times is excited to be one of 31 recipients of a Local Reporting Award from the Chicago Community Trust through the Community News Matters program. Community News Matters, an initiative launched in August 2009 by the Chicago Community Trust and other Chicago foundations, aims to address the news needs of low-income and minority communities on Chicago’s South and West sides. The Local Reporting Awards are intended to produce innovative reporting and analysis of issues affecting minority and low-income neighborhoods. The Local Reporting Award will support Salim Muwakkil—a Senior Editor and columnist for In These Times, an award-winning journalist and a former op-ed columnist for both the Chicago Sun-Times and Chicago Tribune—in producing a series of in-depth investigative feature articles on the recession’s continuing impact on young African Americans. Muwakkil will combine his deep knowledge of Chicago history and its African-American communities with in-depth reporting, grounded in specific South and West Side neighborhoods, to examine the status quo through the eyes of young Chicagoans. His feature articles will be supplemented by short online video pieces and by a series of community forums with partners such as the Jane Addams Hull-House Museum and The Public Square’s Café Society program. In These Times has been based in Chicago since it was founded in 1976 by author and historian James Weinstein. While the magazine has always had national and international coverage and readers, the city retains a particular importance to In These Times. Another Local Reporting Award recipient is Kari Lydersen, who received a grant to produce reporting on environmental challenges and green economy prospects for the South East Side. Lydersen is also the latest in a long line of In These Times contributors who have received a Studs Terkel Award from the Community Media Workshop—awarded in 2001 to Salim Muwakkil. Lydersen regularly writes for the Working In These Times blog, widely considered one of the best, most comprehensive sources for reporting on the labor movement. Working In These Times was recently awarded funding for two more years by the Public Welfare Foundation. 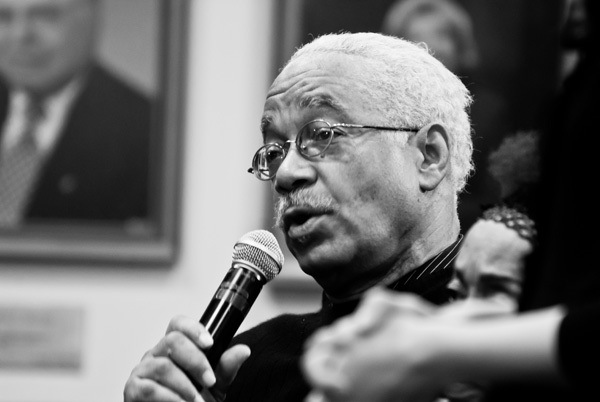 In These Times Senior Editor and award-winning journalist Salim Muwakkil is the host of a weekly radio program on WVON-AM and wrote the text for the book HAROLD: Photographs from the Harold Washington Years. Muwakkil was a co-founder of Pacifica News’ network daily Democracy Now! program in 1995 and co-hosted until 1997. He has also worked as a freelance writer since 1977, publishing articles, book reviews and essays in a wide range of publications. He lectures frequently on issues of race, culture and politics.